Lamar Advertising Company Announces Acquisition of Alliance Airport Advertising, Expanding Media Inventory in Five Airports Across the U.S.
Baton Rouge, LA – July 7, 2015 – Lamar Advertising Company (Nasdaq: LAMR), one of the largest outdoor advertising companies in North America, today announced its recent acquisition of Alliance Airport Advertising. The acquisition adds a variety of traditional advertising and experiential displays in five major airports, enhancing the nation’s most distinctive out-of-home advertising portfolio. Alliance operates airport advertising concessions at McCarran International Airport (Las Vegas, NV); Phoenix Sky Harbor International Airport (Phoenix, AZ); Salt Lake City International Airport (Salt Lake City, UT); Portland International Airport (Portland, OR); and Bob Hope Airport (Burbank, CA). With the transaction, Lamar now operates advertising concessions at a dozen airports that serve more than 125 million passengers annually. "We are thrilled to bring the Alliance team on board," said Lamar chief executive Sean Reilly. "As we've gotten to know the airport advertising business over the last several years, we have recognized that it's a terrific fit within Lamar. Alliance has established powerful relationships with some of the nation's leading airports, and we look forward to extending their proven operating model to additional airports." Shauna Forsythe, who founded Alliance 16 years ago and served as its president and chief executive, will lead Lamar's airport division, to be known as Lamar Alliance Airport Advertising. “Bringing our two companies together creates a powerhouse for our airport partners,” said Forsythe. “Our expanded footprint will offer airports nationwide the opportunity to experience our personal attention and service, with strengthened sales. We are the alternative. And we’re a good one." Photos: Phoenix Sky Harbor International Airport wall banner display (left); Salt Lake City International Airport backlit dioramas (right). Financial terms of the transaction, which closed July 1, were not disclosed. Lamar Advertising Company (Nasdaq: “LAMR”) will release its second quarter ended June 30, 2015 earnings report before the market opens Thursday, August 6, 2015. Lamar will host a conference call on Thursday, August 6, 2015 at 8:00 a.m. (central time) to discuss the Company’s results and answer questions relating to company operations. 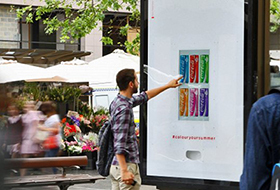 Whether it's advertising for an umbrella or a rain slicker on a cloudy day, or serving up sodas on a scorcher, digital signage and digital out-of-home has it covered.